Is there a Canada goose nest on your property causing you concern? Canada geese sometimes choose to nest in the strangest places, including up against buildings, inside planters in parking lots, in the middle of golf courses, or along walkways frequented by people. Although generally harmless, the goose parents are very protective of their nests, and may hiss and flap their wings or even chase people walking by. This behavior often frightens people and may even inhibit their ability to use specific walking paths or entrances to buildings. If this problem sounds familiar, read on for simple ways to solve it! 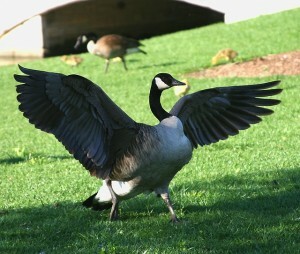 Get too close to Canada goose babies, and the parents will let you know by flapping their expansive wings. Before tackling this issue, it’s important to determine the actual scope of your problem. If your gripe is with one particular goose nest interfering with pedestrian or even vehicular traffic, you’ve come to the right place! If your problem is larger in nature (too many geese or nests on your property or concerns about goose feces), then see our general tips for solving conflicts with geese instead. Once Canada geese settle on a nesting spot, they will return to that same spot year after year. That’s bad news if their nesting spot is causing an inconvenience on your property. It’s also good news because it puts you ahead of the game as you know exactly where to target your nest prevention efforts before the next nesting season. Canada goose nesting season lasts only a few weeks. Once the female lays all her eggs, she will sit on them for approximately 28 days, after which the goslings will hatch and she will lead them to water. So if possible, the easiest thing to do is to simply use another building entrance or walking path for a few weeks until the goslings hatch. Blocking off the path or entrance with some caution tape or a gate may be helpful for making the goose feel more secure and less defensive (and less likely to hiss or chase). 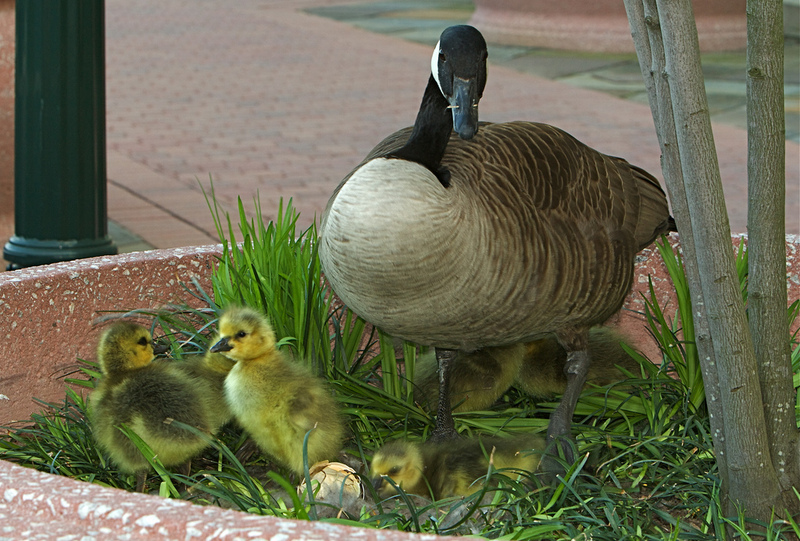 If mother goose has chosen an elevated or fenced in nesting site that will harm or cause the goslings to become separated from mom when she tries to lead them to water see our tips on what to do about that here. When waiting out the nesting season is not possible, another option is to remove the nest and eggs, which will encourage the mother goose to move elsewhere. 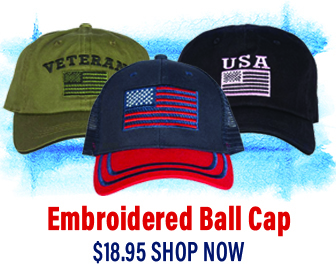 In order to do this, you must first register with the U.S. Fish and Wildlife Service (USFWS). Then familiarize yourself with the correct procedures for encouraging the female off the nest and removing the eggs and nesting material. Finally, remember that geese will return to the same nesting site year after year, so remember to take steps to discourage the goose from nesting in the same spot next year. Having adapted well to living in urban areas, Canada goose nests are found in the most unexpected places. Set up a motion-activated sprinkler (such as the Scarecrow® sprinkler) in the area to deter geese from nesting. Use a time-release repellant (like Fog Force™) which is harmless to people and pets, but irritates geese and will cause them to move elsewhere. Create a disturbance around the area with loud noises, lasers, Mylar balloons, and/or increased human activity. To learn more about how to solve conflicts with Canada geese, see our tips for solving Canada geese conflicts.